Innovation in a Box™ Creates a culture of innovation by enabling people to be successful on real opportunities, in real time. Your people know why innovation is important, but they’re frustrated. Brainstorming efforts are hit or miss, and too often solutions don’t get to the implementation stage. And when you’ve attempted to provide training, you discover that for most teams and most challenges, these innovation approaches are either too theoretical, too complicated, or too time-intensive to be practical. It’s frustrating, because these teams seem to have the knowledge, experience, and motivation they need. What they lack is a concrete methodology to guide them. Innovation in a Box™ equips participants with the practical knowledge, tools, and skills they need to generate breakthrough solutions. We put a carefully curated toolkit into the hands of your people, which they can use immediately to solve problems large and small. 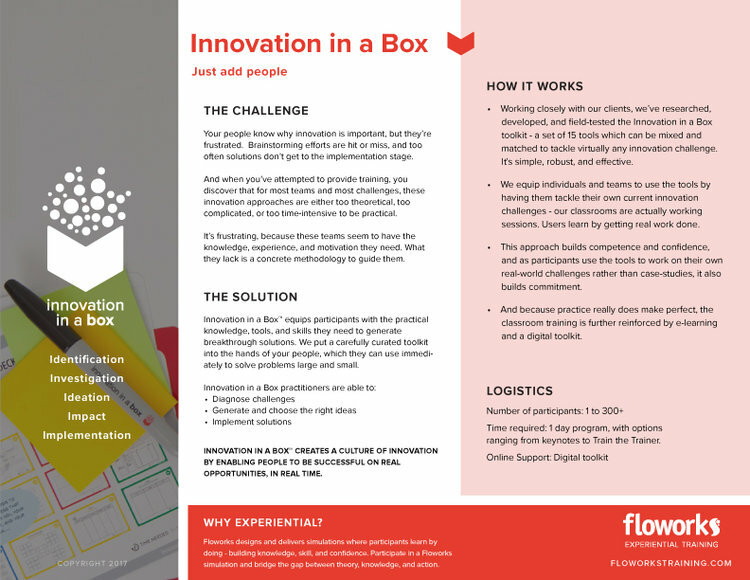 Working closely with our clients, we’ve researched, developed, and field-tested the Innovation in a Box toolkit - a set of 15 tools which can be mixed and matched to tackle virtually any innovation challenge. It's simple, robust, and effective. We equip individuals and teams to use the tools by having them tackle their own current innovation challenges - our classrooms are actually working sessions. Users learn by getting real work done. This approach builds competence and confidence, and as participants use the tools to work on their own real-world challenges rather than case-studies, it also builds commitment. And because practice really does make perfect, the classroom training is further reinforced by e-learning and a digital toolkit. "From my perspective, the entire innovation process using Innovation in a Box is an “a-ha” moment! Using the tools has paved the way for much more focused creative dialogue, pushing our thinking up the innovation curve." "So many "WOW" moments for me - #1 was the visualization of tools - use of strong design principles to drive decision making." "The Innovation in a Box tools have changed the way we structure our brainstorming meetings: we’ve embedded them so they drive dialogue, giving us more structure and focus within our conversations." "We’ve used the tools for well over a dozen workshops to date—and for a variety of objectives including developing corporate messaging; doing strategic planning; and stimulating creative thinking among key stakeholders, executives and physicians." "Participants in the innovation process find the Innovation in a Box tools intuitive, simple to use, and great for driving dialogue. And one of our participants, who sat in on one of our innovation workshops, referred to our working session as one of the best—if not the best—that he had ever participated in." Let us help you cross the gap between good ideas and action.